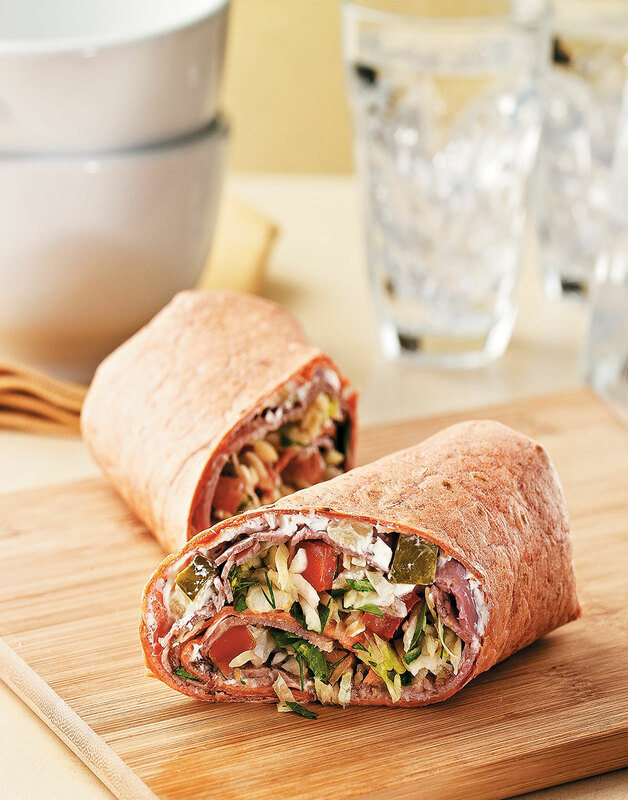 Whether it's wraps for lunch or dinner, or a soup and sandwich meal, these easy Roast Beef Wraps, loaded with roast beef, herbs, slaw, and a jazzed up cream cheese spread are a quick, flavorful, and colorful meal solution. And if you're looking for a soup everyone is sure to love, give this Cheesy Potato Soup with bacon & scallions a try. Any tortilla wrap works here — sun-dried tomato, spinach, whole-wheat, you name it, use whatever is your preference. Combine cream cheese, pickles, and 1 tsp. garlic; season with salt and pepper. Whisk together vinegar, oil, dill, parsley, zest, 1 tsp. garlic, and Dijon. Add coleslaw and tomato; stir to combine. Spread half the cream cheese mixture on each tortilla, layer half the roast beef on the cream cheese, and top with half the coleslaw mixture. Roll tortillas to enclose filling, folding in the sides. Cut each wrap in half on the bias.